If larger US cable operators follow the path of some of their smaller counterparts and play down or retreat from pay-TV, overall subscriber video sub losses could soon accelerate from moderate to torrential levels, Craig Moffett, a top industry analyst at MoffettNathanson, predicts in a revised forecast of the domestic pay-TV market. That broadband-focused/video-indifferent strategy, illustrated well currently by Cable One, does not represent Moffett's status quo, "base case" scenario for the US video market, but warns that the possible emergence of a more blasé attitude toward pay-TV among larger MSOs has become increasingly plausible. To help illustrate how the various video strategies have recently impacted customer bases, Moffett noted that annual video losses at Comcast and Charter Communications are at a "relatively gentle" 1.7% and 1.4%, respectively, compared to the 10.3% video sub loss rate at Cable One. Under his current "Scenario One" base case, Moffett expects losses among traditional US pay-TV distributors to decline by about 4.5% this year, then stabilize to the 3% to 4% range thereafter. 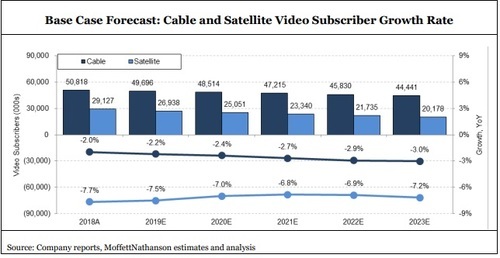 In the current base case scenario, Moffett sees US cable pay-TV declining by 3% in 2023 (versus an expected 2.2% dip in 2019), with satellite TV falling 7.2% in 2023, similar to the predicted -7.5% expected for this year. Under that model, total traditional MVPD subscriptions could fall by 17 million homes over the next five years -- dropping the total from 89 million in 2018 to 72 million in 2023. 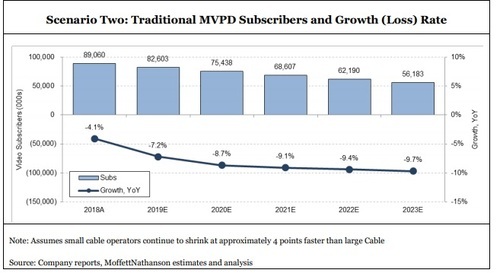 In the other scenario, where even large cable operators willfully abandon video subs and stop making "save" offers, losses would of course accelerate -- from an expected -7.2% in 2019, to -9.7% in 2023. Also, if more cable ops and telcos took that path, revenues would fall, but only modestly. Fueled by more broadband customers, overall MSO margins would rise and capital intensity would drop (set-top purchase requirements, for example, would fall to near zero), and free cash flow would also spike higher, the analyst explained. For satellite operators without a broadband service backfill, this would have an opposite, disastrous effect. Who's most likely to follow the Cable One path? Moffett also took a shot at predicting which of the large telcos and MSOs might follow Cable One into Scenario Two. He sees Verizon Fios as the most likely (notably, Verizon has already begun to focus on connectivity and less so on content), followed by Cox Communications and then Charter Communications. Comcast, which owns NBCU, "has the greatest incentive to defend the status quo and will likely hold out the longest," Moffett wrote. In Scenario Two, Moffett sees Charter losing more than 5 million video subs over the next five years, with Dish's base plummeting to just 5 million total (it ended 2018 with 9.9 million satellite TV subs) by 2023. Comcast, he predicted, would lose about 6.8 million video subs by 2023 (falling to 15.18 million), but the broader financial impact would be diluted due to Comcast's NBCU and Sky businesses. Scenario Two would also result in faster growth for virtual MVPDs. Under an assumption that 80% of incremental traditional pay-TV sub losses convert to an OTT-TV provider, Moffett forecasts that virtual MVPDs would represent more than 30 million of about 87 million total video subs in 2023. That compares to the estimated 7.55 million subs virtual MVPDs had at the end of 2018. Should Scenario Two take hold, Moffett sees total MVPD sub growth (including virtual MVPDs) declining 2.1% by 2023, and dipping by 9.7% (excluding virtual MVPDs) by that same time.